Today’s ATB play seemingly has legs for the long haul, as operators build and market needs fluctuate. The refined product trades are always in flux. Similarly, the supply patterns for products (and for chemicals derived from oil refining) are subject to constant change. At the same time, the distribution of refined petroleum products sees great benefit from the efficiency of Articulated Tug Barges (ATBs), which have the flexibility to adjust to dynamic supply programs between refineries and myriad distribution facilities dotting the coastline. It wasn’t always like that. An ATB combines a normal barge with a bow resembling that of a ship, but having a deep indent at the stern to accommodate the bow of a tug. The fit is such that the resulting combination behaves almost like a single vessel at sea as well as while maneuvering. The Jones Act fleet today includes more than 60 larger tankers and nearly 160 ATBs. Replacing the traditional – and excruciatingly slow – oceangoing tug and tow arrangements of yesteryear, ATBs have produced economies both in terms of reducing manning costs and increased speed and reliability. The ATB’s attractiveness in terms of the traditional tug and tow model is obvious enough. The ability to operate with half the crew of a coastwise tanker, at similar speeds and leveraging a different set of regulatory rules is where the real utility of this unique vessel can be found. That’s not to say that ATBs aren’t safe and/or subject to a high degree of regulatory oversight. They are. Since the mid 1990s, U.S. Jones Act trades have seen a sharp decline in cargoes moving aboard conventional tankers (as Alaska trades declined, and the fleet of older single hull vessels were phased out) and an increase in volume moving coastwise in barges. Beyond this, the advent of additional pipeline capacity killed the need for much of the marine tonnage which ordinarily would have handled that volume. The Colonial Pipeline alone eliminates the need for almost 150 conventional coastwise product tankers. But, pipelines lack the flexibility of a marine vessel, which can be instantly diverted at the whim of the trader. Marine traffic is here to stay and ATBs will be part of that equation. Indeed, U.S. Maritime Administration data – looking at barges of 10,000 DWT and greater, roughly 70,000 – 80,000 barrels capacity for refined products – shows a burst in volume during 2013 and 2014 (the last year for which complete data is available). Not coincidentally, and during a 20 year timeframe, the average carrying capacity of ATBs has increased, as have average lengths of haul. In 2014, the average voyage for the tank barges had grown to 522 miles, from just 387 miles in 1994. Are ATBs competing – and succeeding in traditional blue water routes? The answer is yes. Larger ATBs are capable of runs previously undertaken by conventional product tankers such as trades from Texas ports into Florida and the Lower Mississippi River. There is no precise data on tonnage moving in ATBs – but the numbers are substantial and the market share is increasing. 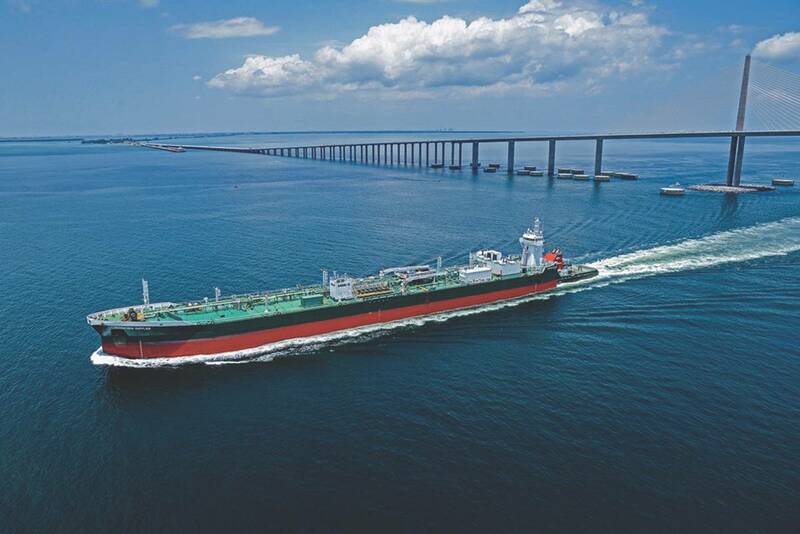 Data from the U.S. Department of Energy reveals that annual movements of refined products by tanker and barge between PADD 3 (the U.S. Gulf) and PADD 1, were 205.7 mbbl (2014), 205.6 mbbl (2015) and 212.4 mbbl (2016) – all around 25 or 26 million metric tons annually. Gasoline blending components accounted for nearly half of these flows, with finished gasoline, jet fuel, and distillate fuel oil accounting for much of the balance. U.S. Army Corps of Engineers (USACE) data shows that coastwise receipts of petroleum products along the Atlantic Coast (equivalent to U.S. DOE’s PADD 1) equated to 36.3 million metric tons in 2015 (the last year where data is available). This implies that intra-regional movements within PADD 1 were at least 10 million tons (not including moves within harbors which presumably would move in smaller barges into smaller local terminals). Kirby Corporation, a titan of the inland markets, reinvigorated its entry into the coastwise markets in 2011 with its purchase of K-Sea Transportation (followed by its acquisition of Allied Towing the next year), providing it with a considerable ATB fleet. Much prior to that, Kirby signaled its long term intentions when it purchased Sabine Towing and Transportation in 1992. At the time, Sabine operated 38 tank barges, 24 harbor tugs and push boats and six aging coastal tankers. Importantly, approximately 65 percent of Sabine’s revenues at that time were derived from coastal tanker operations. Over time, those tired, single hull tankers went away, to be replaced with gleaming, double hull barges – and, eventually, ATBs. Not surprisingly, Kirby also ordered two smaller ATBs, pairing 6,000 HP tugs with 155,000 barrel capacity barges. Meanwhile, the K-Sea fleet is a mainstay of Kirby’s operations in the Northeastern seaboard trades. And, Kirby continues to invest in the ATB concept. 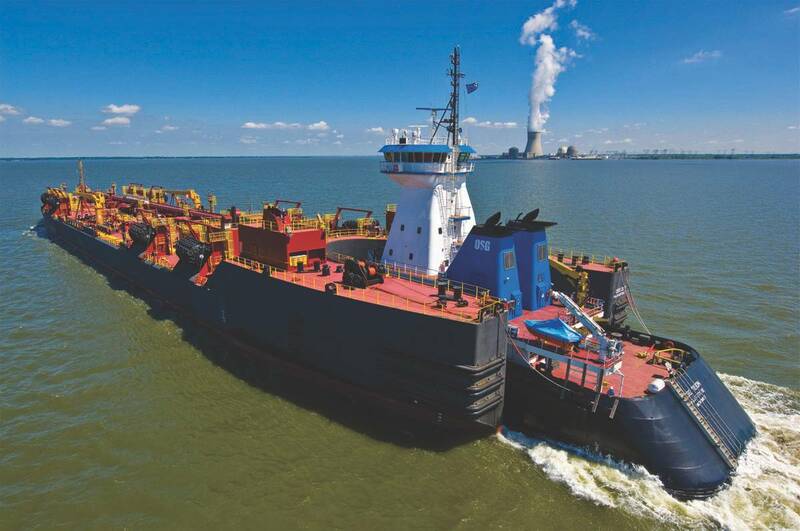 Crowley also operates two other classes of ATBs – the 550 series (with barges of 155,000 barrel capacity) and the 650 series (with barges of 178,000 barrels capacity). Its equipment trades on all three U.S. coasts. Reflecting the trend towards larger ATBs, privately held Bouchard Transportation is another Jones Act operator which has upsized. Recent tracks show these 250,000 ATB units trading between Texas and the Lower Mississippi River. Its smaller units trade actively along the East Coast. Meanwhile, Vane Brothers, active in the fuel trades along the U.S East Coast, also operates a pair of 145,000 barrel ATBs. Vane, doubling down, also has three smaller ATBs under construction, according to its internal Pipeline publication. OSG is back in business after a complete re-organization. After jettisoning its international flag tanker business, the “new” OSG is now a pure Jones Act operator. Its fleet of 10 ATBs include older units that came to OSG with its 2006 acquisition of Maritrans , which had a legacy coastwise barging business centered around hubs in Tampa and Philadelphia. Two modern ATBs built with generous 342,000 barrel barges are mainly deployed in lightering operations in Delaware Bay. Eight other ATBs (some with barges originally single hulled but retrofitted to comply with OPA 90’s double hull requirements) round out its ATB business model. Reinauer, which owns the Senesco Shipyard in Rhode Island, participates in the movements along the East coast within PADD 1. Its fleet includes more than a dozen ATBs. Moran Towing participates in similar trades from the U.S. Gulf into Florida. 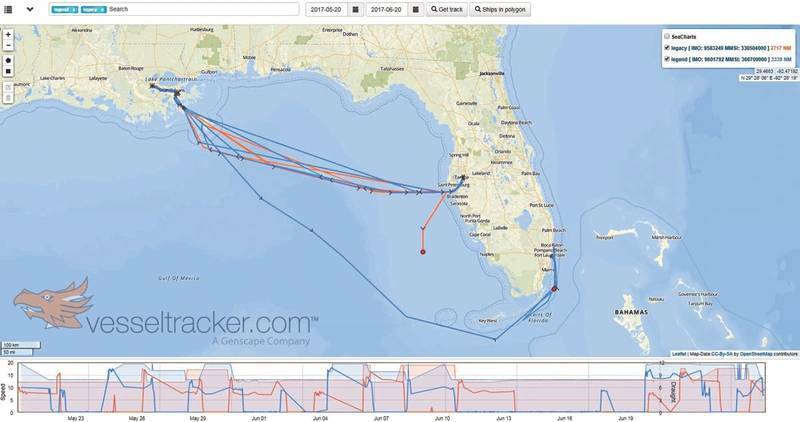 Its vessels have been tracked taking gasoline from Pascagoula to Port Everglades, Fla. – not coincidentally the leading coastwise destination for refined products moves. A new entrant to the ATB club is Harley Marine. Its tonnage is new, and the fleet is growing. Two additional ATB units are slated for delivery in 2017. This operator trades in clean products on the East and West Coasts. Charter and asset markets for tankers have swooned in recent years, following the huge run-up in wet markets during 2014. OSG, in regulatory filings, said, “… Impairment charges aggregating $104.4 million on seven of the Company’s eight rebuilt Jones Act ATBs were recorded during 2016.” Its two lightering units earn high per diems, all booked on a spot basis. Hires for its fleet of smaller and older ATBs are lower – especially those that moved into (less favorable) spot trades in 2016. Cargo flows and distribution patterns will continue to evolve over time and the flexibility of ATBs will be pivotal as the needs of the market also change. Participants in the trade are keeping a weather eye on developments which include the burgeoning infrastructure linking the Permian Basin with refineries on the Gulf Coast, which could lead to additional coastal product moves. A potential reversal of a Buckeye Partners pipeline in central Pennsylvania could set the stage for more coastwise shipments of product from Philadelphia-area refineries (presently moving inland). Changes are also coming to the marine fuels markets in 2020, when refiners will likely be producing increased quantities of low sulfur fuel, and transporting them to bunkering ports. But, what about the ATB itself? A talk with the universally recognized authority on ATB design, Bob Hill of Ocean Tug & Barge, reveals a few important points. First, any fears that the traditional (reduced) manning protocols on these vessels might change has been put to rest, especially since the Coast Guard largely ignored that aspect of the regulatory picture within their recently released subchapter M towboat rules. That financial advantage isn’t going to go away. Secondly, Hill reports that customers are consistently asking for a faster boat, something that would close any remaining gap between blue water coastwise performance and that which the ATB is capable of providing. When and if that improvement can become reality – and Hill himself says the effort involves more than just adding some zip to the engines – the ATB business model that has, for the last twenty years become a big part of the coastwise landscape, will only improve with it. And if, as Crowley’s Ara says, the 750s are the only ATBs that can today logically compete in the blue water sandbox, then that’s likely about to change as the overall ATB fleet becomes progressively larger and eventually, faster.